It has been a busy couple of weeks for 608 Sound and Light. With our recent name change, there has been a lot of behind-the-scenes work to be done… updating our promotional materials, contacting clients and venues, labeling gear, working on the website; the list goes on and on. Thankfully, we have managed to find time to attend several live sound productions in the Madison area. 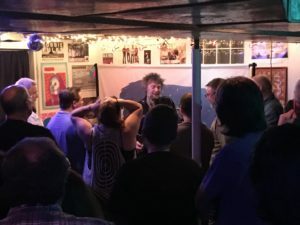 We really are a lucky group of people – Madison hosts so many wonderful live sound events – from small bands at neighborhood bars to open jams to national (and international) touring acts at larger venues. Madison really is a music-lover’s paradise. It’s only Wednesday, and we have already attended six live music performances over the past 3 days. Unless you’re living in Nashville or Austin, I doubt you’d be surrounded by so much live music. Heck, we ventured to four different music events on Tuesday, alone! There was the Maximum Ink Magazine Jimmy K show at the Wisco, Onadare at the Malt House on East Wash, The Lower 5th at the Up North Bar, and finally the Open Jam at the Red Zone. Yes, it was a full evening, but it was truly enjoyable and extremely rewarding. While out and about, we couldn’t help but notice the tremendous support for live music that exists in our community. It’s not easy for venues to host live music – there are logistics to consider, expenses, and countless other variables. The artists don’t have it easy, either – there’s practices, equipment to haul around, time away from the home, and pressure to perform. Support from the audience and community goes a long way and means a lot to everyone involved, so thank you! And that brings us to our final point – we know how difficult it can be to produce a live music event, and that’s why we are here. 608 Sound and Light can take the pain and hassle out of your next live sound production or music event. We have nearly 30 years of experience with live sound and lighting production in the Madison area. We have an unbelievable arsenal of world-class sound and lighting equipment. Our staff is unbelievably friendly and extremely talented. If you’re in need of any type of live sound or lighting production service in the Madison area, 608 Sound and Light can help. Give us a shout! Pro Sound Madison has changed its name and look – we are now 608 Sound & Light. Welcome to our new site! Fret not, we are still the same great company that provides the very best live sound service and lighting services for Madison and surrounding cities. So what’s with the new name and look? Thanks to you, our truly outstanding clients, partners, and fans, we have grown faster and more wildly than we ever could have imagined. When we made the decision to officially launch our own live sound production company, we never anticipated the demand would be so great and the response so positive. We are so honored and grateful for everyone that has worked with us – you’ve made us what we are and we couldn’t be any more happy. With the unexpected positive reception came numerous requests for us to provide live sound and lighting production for festivals of all shapes, sizes and locations. We were regularly being requested to deliver quality sound and amazing lights for events all around Dane County. After some careful thought, collaboration (and some time with Photoshop), we had ourselves a new identity: 608 Sound and Light. Along with the new name, we have a ton of equipment enhancements and additions. We are now working solely with JTR Speakers as their performance is truly second to none. The clarity, power, precision, and coverage is unbelievable. We have transitioned completely to QSC PL380 amplifiers – these amplifiers are incredibly reliable and insanely beefy. And last but not least, we have greatly expanded our light show and lighting gear to include a total of 8 moving heads (combination of washes, spots, and hybrids), 35 LED PAR lights, 4 LED pixel bars, 2 multiple effects heads including lasers, and a really effective fazer/hazer. The lights greatly enhance performances – we’re extremely pleased with them, and so are the artists and venues we work with. So… thank you again for all of your support, kind words, repeat business, and interest in what we do. While we will miss the Pro Sound Madison name, we are confident that you’ll find 608 Sound and Light provides incredible live sound and lighting services. Rest assured we are still the same friendly, reliable, professional, and capable sound and lighting production company that you have relied upon over the past year. Make note of our this new web address (www.608soundandlight.com), our new e-mail address (inquiries @ 608soundandlight . com <<-- remove the spaces). Our phone number is the same, as is our staff, our performance, and our capabilities. Let's make 2017 the best year ever for you and your events (festivals, parties, happy hours, corporate events, speaking engagements, dances, and anything that requires quality sound and light production)!!! Cheers and thanks again!!!! 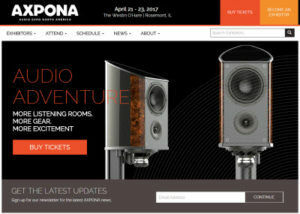 608 Sound & Light is *excited* to announce that we were asked to provide sound services for the 2017 Axpona (Audio Expo North America) Live Music concerts on April 21 and April 22, 2017. 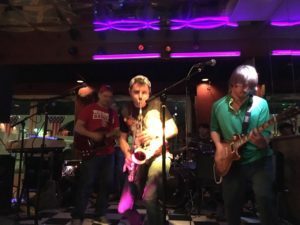 This international event attracts people from around the world, and each day is capped-off by three hours of live music, from 6:30pm to 9:30pm. The event is held at the Westin O’Hare in Rosemont, IL. Massive thanks go out to Jeff from JTR Speakers for coordinating this, and for submitting us for consideration to provide live sound production and lighting! We will be using JTR’s awesome line of products (Noesis 3TX, Noesis 2AX, and some top-secret other gear), and we couldn’t be happier! JTR speakers are incredible – they offer clarity, range, accuracy, and output like none other. If you’re planning to attend the Live Music event during Axpona, be sure to look for us and say hi! We’d love to chat with you! Hello fellow music lovers! From everyone here at 608 Sound & Light, we hope you had a wonderful holiday season and that the new year is off to a good start! We certainly have been busy over here! Between shows, maintenance, and the events of daily life, it feels like we haven’t had a moment to breathe, let alone rest. But, you all know how that goes, I’m sure! – We are booking shows well into 2017. 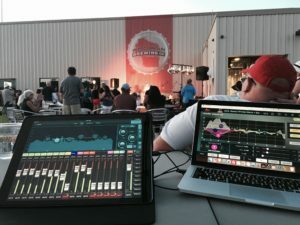 If you are planning an event, a festival, a bar gig, a party, or anything that will require live sound production here in Wisconsin, contact us SOON. We aren’t kidding when we say that we are already booking shows into September of 2017, and are negotiating on several events that haven’t been posted to our calendar yet!!! – TONS of new gear, literally. We have been busy upgrading some of our core gear, and we are *excited* with all of this excellent new live sound production equipment! We said good-bye to our faithful and beloved Behringer XR18 Air rack mixer and upgraded to the Behringer X32 Rack. 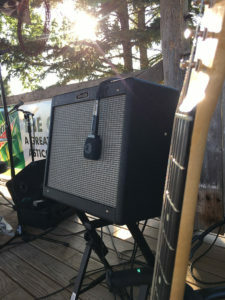 The XR18 served us very well, but it’s in a great new home with a local band, and they are loving it. And we’re loving the X32 Rack! We have it paired with a Behringer S16 stage box to deliver 32 balanced (XLR) inputs at your next important event. 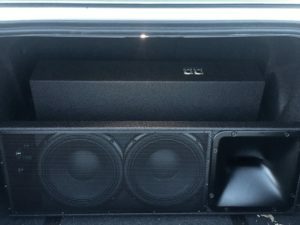 We also purchased new JTR subwoofers, and couldn’t be more excited, because they are absolute *beasts* that will really punch-up the low end of your next show. Each of these new subwoofers requires 4000-watts of power… good thing our QSC PL380 amplifiers are up to the task. Why not visit us at an upcoming show to check them out, or better yet, feel them for yourself when we provide sound production for your next event! And finally, we purchased a pair of Yamaha’s amazing DSR115 active speakers. 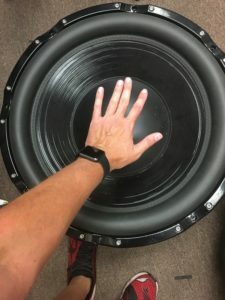 The DSR115 are a 2-way, powered speaker with a 15″ woofer and a 2″ titanium compression driver, and are capable of delivering 136dB of clear, powerful sound. We use them as drum monitors, side fills, and FOH speakers (for small venues). The DSR115 are unlike any other powered speaker we’ve ever used, which is why we made the investment in them. Alrighty… I suppose that’s enough shop talk for today. It’s time to get busy in the shop – January is more-or-less fully booked! Thanks for checking in with us, and we hope to see you at a show sometime soon. Until then, stay healthy, take care, and rock on!! It has been an incredibly busy year for 608 Sound & Light. 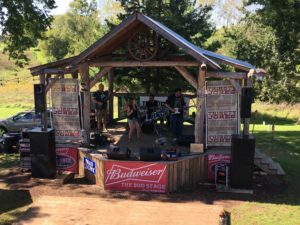 We provided live sound production for a number of events here in Wisconsin, and we’ve provided sound services for dozens of performers, bands, and acts – ranging from local to international touring groups. 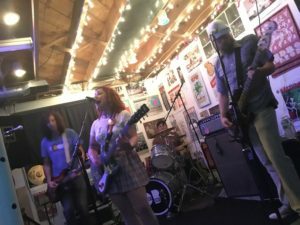 Countless bands have reached out to us to ask for price quotes, and most are surprised by our response of “it depends.” We shared an earlier blog post about this, but it warrants a revisit, albeit with additional information. 608 Sound & Light thoroughly enjoys working with and supporting performers, venues, events, festivals, bands, houses of worship and everyone else. We wouldn’t be in the business if we didn’t enjoy it; the hours are often long, the equipment is heavy (and expensive), and we put a tremendous amount of effort into producing every single show that we’re a part of. As I examine our inventory and insurance lists, we currently have just under $100,000 worth of sound production equipment at our small warehouse. None of it was financed – we paid for it out-of-pocket and aren’t carrying debt on our books. We have fixed, monthly costs regardless of whether or not there is an event: insurance on our gear, business liability insurance, rent, and utilities. 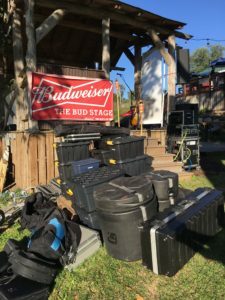 When it comes time to provide live sound services in Wisconsin, we have additional costs: employee costs (food, drink, wages), travel costs (fuel, mileage, maintenance), and inevitably, a few extra production costs (small amounts of gear). 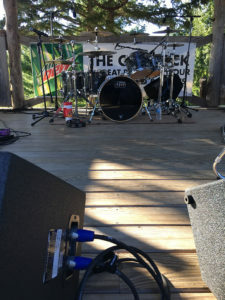 As you can see, expenses add-up quickly… let’s say you had a small outdoor show and needed 4 subwoofers, 2 main speakers, 3 amplifiers, a mixer, a few microphones, a few monitors, and basic lighting – you’d likely be quoted at around $1000, not including labor (typically around $150 – $400/person per day). That’s quite an expensive show! A weekend festival could easily cost several thousand dollars! DJs are another often expensive crew – we were at a friend’s wedding a few weekends ago and were surprised to learn that their DJ “cut them a massive deal” by only charging $1400 for the night. His system consisted of 4 plastic self-powered speakers (that were too small for the venue), a single t-bar of lighting, and some LED “up-lighting” (a $500 addition). He arrived in a small SUV, and was in-and-out in 5 hours. Not bad! Our rates aren’t anywhere near this range, yet we are regularly asked to provide sound for $100 or so… unfortunately, we don’t have that type of business model. The $100 range is going to get you a questionable PA system that will likely have numerous limitations and potential issues. 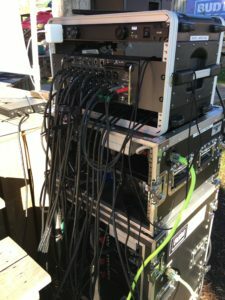 Our “smallest rig” usually consists of 4 main speakers (2 subs, 2 mains), 3 amplifiers (1 for subs, 1 for mains, 1 back-up), 4 monitor wedges, 1 monitor amplifier (4-channel), a digital mixer, digital sound processing equipment, 6-10 microphones, stage power, and a few t-bars of lighting. We are regularly asked to provide this set-up for $100 – $150, and while I wish we could, it’s simply impossible to do so. Hopefully this is some helpful information when shopping around for local sound companies and production services. 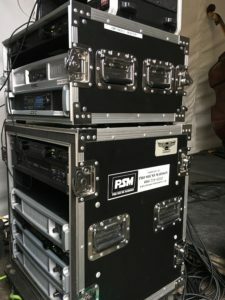 We want to be as reasonable and supportive as possible, but keep in mind, our gear is worth around $100K and we’ll spend an average of 8-9 hours at your event between load-in, set-up, calibration, engineering, and load-out. We can’t be the cheapest option around, but we guarantee to surprise you with our quality and professionalism. Enjoy the holiday season and give us a shout to compare our equipment, experience, and rates! 608 Sound & Light is pleased to announce that we now offer a few different lighting rig options – from basic LEDs on tripod stands to full trusses with moving heads and laser effects. You asked for it and we were happy to oblige! 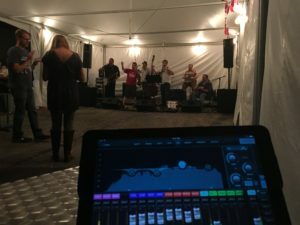 We explored several options for controlling our new lights – from small DMX controllers to software DMX to full-scale lighting desks… We tried a few options before settling-in on software with MIDI controllers. 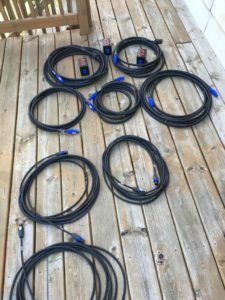 For anyone who may be struggling with configuring their DMX controller, allow us to share a few tips/tricks that we discovered along the way. Our base system consists of: Enttec DMX Pro USB Mk2, a MacBook Pro Retina, QLC+ software, and a Novation MIDI controller. This rig will likely handle most of our real-world jobs – to deploy the full rig would cost more than most folks will want to spend. Our MacBook Pro runs OS X 10.11.6 (“El Capitan”) – we haven’t made the jump to Sierra quite yet. Our Enttec DMX Pro USB Mk2 had its firmware upgraded to the latest and greatest (4.12). We tried using QLC 4.10.4 (current version), but had numerous issues with it… we reverted to 4.10.3a instead. The biggest issue we had was with DMX output – no matter what we tried, we couldn’t get QLC+ to send a DMX signal to any of our lights. We tripled-verified that our lights were properly addressed and assigned, yet the room remained dark. After spending the better part of a full day researching, we discovered that QLC+ is *extremely* sensitive to FTDI drivers, and Apple doesn’t apparently play nice with these drivers. Other software (Chameleon, LightJams, D Pro) didn’t seem to care as much, but we really liked the QLC+ interface, so we were determined to resolve the issue. If you encounter a scenario where your Apple Mac computer won’t output DMX with QLC+ and an Enttec DMX Pro USB Mk2, you *must* locate and run a third party FTDI driver conflict resolution package called “D2XXHelper” – if you don’t, chances are your lights will never operate properly. As soon as we ran FTDICHIPS D2XXHelper and rebooted our laptop, everything functioned properly. To ensure consistent results, we’ve reverted to QLC+ 4.10.3a – it seems to be more stable than the newer versions (as of this writing). Once we had these items in place, we set about programming our fixtures, scenes, cues, and chases, and I must say – things are looking great. So there you have it – hopefully a helpful tech tip for anyone else who may be having problems with DMX output on a MacBook. We’re going to get back to programming… we’ll see you at a show, soon! Time to plan for 2017! As hard as it is to believe that the summer is already behind us, it’s time to start looking ahead to 2017, especially if you are in charge of planning and organizing a festival or event that requires live sound production near Madison, Wisconsin. 608 Sound & Light had an excellent first year of providing live sound production services in and around the Madison, Wi area but we would love to do more in 2017. We helped support and produce some truly outstanding shows this year and are in discussions with several of Wisconsin’s biggest and best events to provide live sound services in 2017. Take the worry and hassle out of renting equipment or trying to hire someone to provide live sound support for your upcoming event – drop us an e-mail or give us a call and we’ll be happy to help! 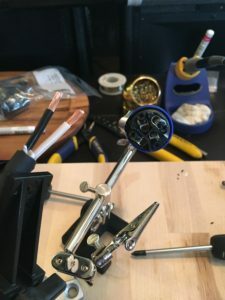 Everyone who has worked with us in the live sound industry has raved about our professional staff, meticulous precision, obsessive quality, and easy-going nature. We really do make things easy – from providing plenty of stage power taps for the bands to coordinating stage plots and layouts to keeping the event running smoothly and on time – we do it all. 608 Sound & Light is also pleased to announce that we have a full lighting system available as a part of our live sound production services. Our system features 16 LED PAR lights (RGBW), LED light bars, LED Blinders, LED moving heads with gobos, and a super smooth fazer that’ll provide just the right amount of fog. 2017 will be here before we all know it, so don’t delay – call or e-mail 608 Sound & Light, and let us work with you to deliver the best possible live sound production service for your upcoming event, festival, party, speaking engagement, or gig. We provide live sound production services for most cities in-and-around the Madison, WI area! Oh – and if you haven’t yet downloaded a copy of our 2017 Information Kit, please do! It has all of our latest and greatest information and details. We’d also be happy to mail you a hard copy, complete with some extra goodies – just ask! The 608 Sound & Light crew has been busy around the shop – there’s never a dull moment, that’s for certain! We’ve improved and increased our inventory and equipment and have been busy with live sound production in and around the Madison area. We are grateful for everyone’s interest and support, and we have enjoyed every single show. I often comment that it’s difficult to mix the FOH (Front Of House) show when I’m busy tapping my toes and drumming with my fingers because I’m enjoying the performance so much. 🙂 Just shows you how lucky we are to work with so many awesome live bands and artists! 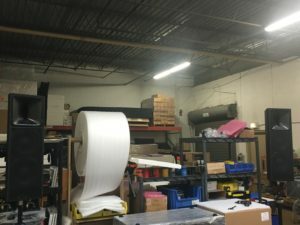 Here’s a quick run-down of some of the recent events, additions, and news from 608 Sound & Light. Please be sure to contact us as early as possible for any of your potential shows, gigs, or events – our calendar is filling-up quickly! Most people take power for granted – it’s always there when you need it, right? Normally, yes. But when it comes to “backline stage power” for a performance, there’s a lot more to consider. Thanks to our new OA Windsor boxes, 12/3 SOOW cable, Neutrik NAC3FCA 20-amp PowerCon connectors, and Hubbel 20-amp hospital grade receptacles, we are able to place clean, safe, reliable power anywhere on the stage. We are proud to offer six independent boxes and more than 150-feet of cable options. We are loving our newly configured amplifier racks. Clean, simple, and powerful!! 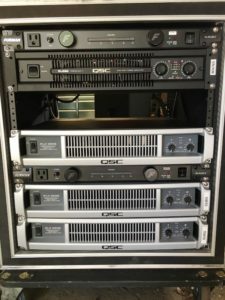 18,800-watts of live sound QSC power for your next gig, show, festival, or event! Simply put, we LOVE our QSC power amplifiers. They never run out of gas and always sound incredible. They are super efficient and uber-reliable. We carry spares in the event of the unthinkable – not many sound companies can do that! Anytime you’re moving heavy, cumbersome, expensive, and delicate equipment, there’s going to be challenges and problems. To combat unexpected issues, we proactively monitor and maintain our gear, especially the “heavily used and abused” stuff like cables. 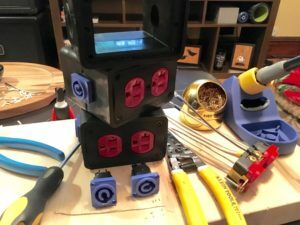 After a few untimely failures, we have taken the plunge by investing in and replacing any non-Neutrik connectors with quality Neutrik connectors. Neutrik makes the best connector, bar none. Reliable, foolproof, and simply great. Sure, each speaker connector costs around $7, but they’re worth every penny. We also took the plunge and proactively replaced all of our subwoofer drivers. The original RCF drivers were good, but a few of them were showing signs of their age. 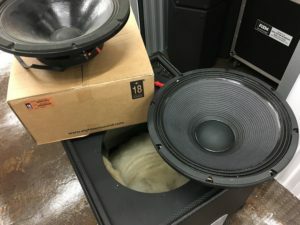 So, we called the folks over at 18Sound and within a few days (and a few thousand dollars later), we had brand new, 18-inch, 2400-watt drivers. The 18Sound drivers are *incredible* – so smooth, so controlled. We are loving the lows that these deliver, and so will you!! Let’s be honest – this is why we do what we do. We LOVE music, especially live music. The energy, the crowd, the vibe… it’s all so enjoyable and addictive. We also love making bands and performers sound their absolute best. We’re able to do what we do because we have great equipment, we take care of it, we are constantly improving, and we have the experience to work with any type of venue, performance, or situation. So, there you have it. A brief look into what’s been keeping us busy lately. Thanks again to everyone for your support and interest! Some of the gear no one ever sees… road cases for days! We are in love with Mark Fairchild’s DW kit. It sounds incredible and Mark knows how to work it! 608 Sound & Light wouldn’t be as good as we are without the support of our wonderful vendors and partners. We are truly fortunate to work with some of the finest people in the industry, and that quality shows in the service we deliver. 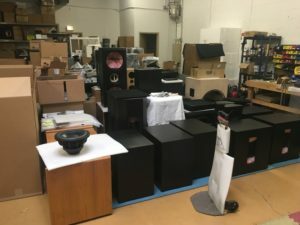 We recently took a field-trip to Chicago, IL to pick-up some new speakers from JTR Speakers. JTR produces top-notch, audiophile speakers; you may not have heard of them before, but they are legendary in certain circles. We are truly honored to work with them and to utilize them in our systems. JTR’s lead engineer and designer has an impressive resume – before starting JTR 10+ years ago, he worked for one of the most innovative and well-respected names in the professional sound industry and was responsible for creating some of the most impressive speakers in use today. We arrived to the shop in the early evening and were given a demo of the Noesis 3TX mains. They were coupled to a Captivator 118 sub and were powered by a SpeakerPower SP2-4800 amplifier, with zero processing or EQ. We played a demo CD and were instantly impressed. The clarity of the horn-loaded midrange and tweeter were ridiculous. No matter how loud we went with the sound, it remained clear, detailed, and smooth. After the demo was complete, we were sold. We took some time to snoop around the factory and were wowed by the attention to detail, the quality components, and the impressive designs. Jeff is one incredible guy with an insanely excellent product. Again, we are so pleased to be partnered with JTR Speakers. We have some exciting things coming, so stay tuned! We just wrapped-up an incredible weekend with the fine folks from the Wil-Mar organization, where we provided live sound production service for their KidsFest Stage as part of AtwoodFest 2016. It was a really enjoyable festival- we met a ton of great people, worked with some amazing musicians, and had a great time! 1. Good, reliable power is crucial! 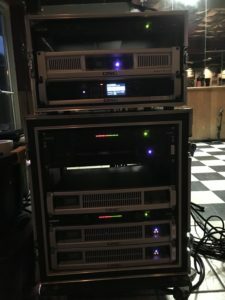 We don’t require a lot of power when compared to other live sound companies, but we do require at least two (2) 120-volt, 20-amp circuits for the PA system. 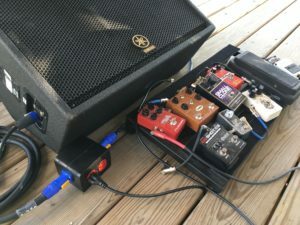 If your band requires additional stage power, then we would really like to have access to three (3) 120-volt, 20-amp circuits. The power should be located as close to the stage area as possible, and power needs to be confirmed as working and functional. When we arrived to the festival, we discovered the nearest outlet (one, and only one) was more than 150-feet from the stage, and even worse, it wasn’t working. It had a bad receptacle. Thankfully, we were able to get the receptacle replaced and working just minutes before the festival started. We also managed to find one more outlet (another 150-feet from the stage, opposite direction), and were surprised that we ran the entire weekend on two circuits, with more than 300-feet of distance from the stage. Whew!!! We don’t ask for much, but we really do need access to good power. 2. For festivals and events with multiple bands, detailed line-ups, stage-maps, and any other information about the performers’ needs are appreciated. 608 Sound & Light supported a total of thirteen (13) acts over a period of two (2) afternoons. Each act had their own, unique set-up and needs. Knowing as much as we can beforehand about each group ensures a smooth, seamless stage transition. It also avoids potential technical issues. One of the acts required a CD player, which was not identified as necessary by the organizer. One of our engineers was able to (literally) run to his house, get a CD player and run back to the show just minutes before it was needed. Without that, the act wouldn’t have been able to perform! 3. Sunscreen and hydration are super important. We love being outdoors, especially when we’re providing sound for a great festival or event. Make sure you bring plenty of sunscreen – our particular stage was set-up directly in the afternoon sun, and while it had a bit of a shade, many of the performers didn’t have sunscreen and were visibly uncomfortable. We shared our sunscreen with those who wanted it, and we had a cooler full of ice cold water and carbonated beverages. 4. If you can arrive to the stage a little early, things will go much easier. Most of the groups that we worked with were excellent about arriving to the stage with plenty of time before their scheduled performance. This was great, because it allowed us to chat with the musicians, understand their set-ups and needs, and just hang-out and enjoy a bit of time together. Those shows also sounded the best – surprise, surprise! So there you have it. A few lessons learned from the festival weekend. Small glitches aside, it was a great event, and we can’t wait to work with other festival organizers and musical groups! 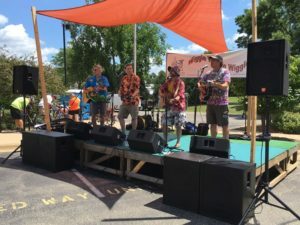 We worked with bluegrass bands, rock and roll bands, kid-oriented bands, dance troops, percussion groups, and DJs, and we had a great time, with great sound, and tons of positive comments and compliments. We’d love to work with you soon!